Almost every double page spread has an arrow on it made from old-fashioned lined school paper with the dotted middle, and the art is done in mixed-media collage. The letters on the arrows are cut from newspaper print. The black poodle with the purple bow shows so much texture, a reader will be tempted to touch the page. The tree is tweedy burlap, and the cat is polka dot cotton with yarn whiskers. Susan Holt Kralovansky loses no opportunity to advertise her other books and includes them over and over and then all together on the last double-page spread. The end papers are teal. The title page shows an old-fashioned libarary book with the pocket where the check-out card would go. In the olden days, a child could see who had checked out the book before he did. Now with technology, that feature is gone forever. The Book that Jake Borrowed becomes more appealing with every read. The first time through, the lack of punctuation ruffled this English teacher’s feathers. Not sure why an exclamation stuck in the middle of a sentence wasn’t done in a different font or color to show that it is a spoken and fun interruption in the telling. 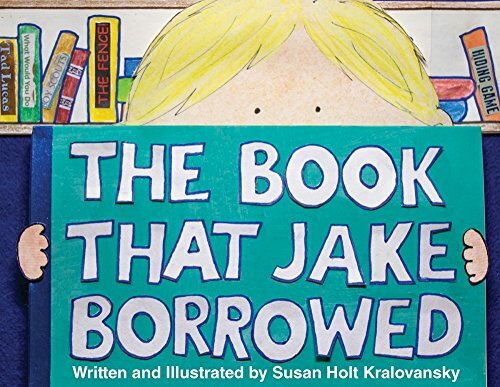 Other than that, the book is great and one that a young reader can memorize and “read” with a parent. The ultimate message is twofold: take care of your library books, and librarians are wonderful. And in this case, so is a good writer and illustrator.